There has been a lot of mixed reactions toward Amazon putting advertisements on Kindle, especially when it was first launched in 2011. Today I wish to bring this issue back into the spotlight and invite you to re-examine it together. In the article Why Advertising Could Become Amazon’s Knockout Punch, Joe Wikert attributes Kindle’s popularity partially to Amazon’s Special Offer, as it “lowered the price of the device” and presumably would not interfere your reading experience (which the advertisers find very reasonable and worthy of their money, of course). Wikert then predicts that Amazon’s next step might be making money on in-book ads. He explains his theory by explaining Amazon’s wholesale model of publishing, and even goes on predicting that Amazon “would love to see ebook pricing approach zero” — which can be realised with in-book advertising strategy. All of this will eventually help Amazon “eliminate competitors” and obtain to market dominance”, as it has been doing in the past four years. Jamie Lending takes a quite strong stance and describes Amazon Kindle Special Offers as a disgrace. “Unobtrusive” and “never in your reading experience”, says an Amazon spokesman in response to Lending’s complaint, but many readers still find the ad-free version irresistible despite the fact that they have to pay extra 30USD. While Amazon frames it as a Kindle user’s choice, Lending argues that the company takes away the “ultimate control” over ad exposure. Kevin C. Tofel, in his article Ads on Kindle Fire HD tablets: Bad news or just business?, presents argument from both sides and comments that the subsidy of being able to control “is financial in nature”. Tofel’s opinion differs from Lending in the sense that he believes readers still retain some choice. Is this really a question of whether consumers are willing to pay or whether they can afford it? And what exactly does it mean to publishers and authors? I am trying to find contests for poetry books already published. My book, “On the Rim of Wonder” was published last April (2014). I find lots of contests but for books written but not yet published. If you want to see a review, go to Amazon or Goodreads–a lengthy, detailed review can been seen on both. Any info will be greatly appreciated. I find that I have lots of opportunities to acquire free or almost-free hard copy books these days. They come from friends, neighbours, libraries, free shares, and remainder tables. I also have a Kindle, which I like. If Kindle were to include ads, I would use it a lot less and the abundance of second-hand hard copy books more. Greed, greed and more corporate greed. I remember reading a NY Times article about an author who was sponsored by some company to mention a certain product multiple times in her book. This is a strategy I imagine amazon could utilize to push the ebook prices down. It’s funny, though, I’ve noticed some authors use brand names in their books even without being paid. Either way, it’s pretty tacky. Wow, I didn’t realize they did this. Clearly I don’t know a lot about this, but it makes me glad I have an older Kobo reader instead. One day all life will be one long stream of ads occasionally interrupted by some creative content. Businesses built entirely on the income from ads, Google, Facebook et al, will reach critical mass when consumers grow tired of the bombardment. In-book ads might be the turning point in Kindle’s dominance of the market and if I were Jeff Bezos (god forbid) I’d approach the issue like you’d approach a sleeping alligator. I grudgingly paid the extra money for an ad-free Kindle, because I am so sick of ads being everywhere. You can’t see anything without an ad attached to it. They are intrusive and they do interfere with my reading experience and just about every other experience. Sorry for the rant. The prevalence of ads is getting ridiculous. I’ll be interested to see how this story develops. I’m sure it won’t be good. 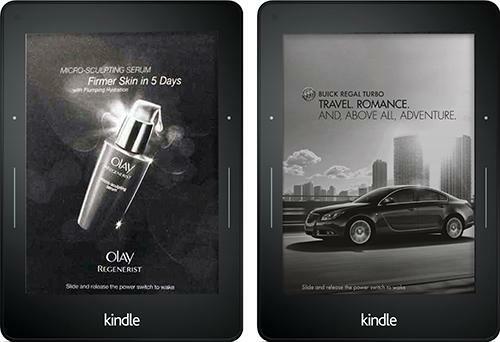 I don’t mind the ads for other books on my Kindle (provided it is not in active reading mode). I don’t care for the non-book related ads, but I put up with them as they are very much like an ad on the back of a magazine. However I would not tolerate a pop-up add or banner add in my ebook while I am actively reading. I read to immerse myself in the story and ads are some of the quickest way to remind me the that the story isn’t real. I apologize for the typos. I am still waiting on my coffee to kick in. A thought-provoking post – thank you. Very good question about what it means for authors royalties. Although I’m sure the answer involves the word ‘less’.